Day 3 in Mumbai, India! Sadly, I can’t post any pictures or videos yet. Which is unfortunate because this place is like no other place I’ve ever been. It’s taken about 3 days to really adjust, but feel like I’m on a normal schedule now after the almost 15 hour flight. I’m staying at the Taj Hotel in Bandra, one of the business areas of Mumbai. I think the funniest thing is that every day I come back and my things are arranged just a little differently. And they have picked up on the fact that I’m a female because yeterday I found a pink silky robe in the closet and eye and face cream in the bathroom. The service is impeccable no matter where I am (almost too good, there is no need to stop what one is doing and wait for me to walk by). I guess I’m just used to fending for myself in New York! I thought the disparity between the wealthy and poor in the US was wide, but it’s even more pronounced here. I can eat a full meal for $2 at the “Food Court” at the office and $80 on dinner at a higher end restaurant. We’ll drive by some very interesting looking areas on our way to work and dinner. The slums are known as Dharavi, and are Asia’s largest slum. I’d like to explore more, but not sure that’s such a good idea (yes, mom, thinking of you here). Yes, the Food Court was not like the one at the mall, it’s a sit down outdoor restaurant with a menu. Luckily, Gowri orders for us and gets us what is good. The Crispy Chicken came highly recommended by my colleague, and it was delicious. And the variety of breads is fabulous…naan, roti, paratha, I love it all! I’m on a “lots of carb” diet in Mumbai. I was surprised when the Gowri, the team leader for the group here asked what peanut butter was like. Had I known she hadn’t tried that or black licorice (which I thought was odd they don’t have it since the after meal seeds taste just like anise), I would have brought these 2 items instead of candy corn and mini candy bars from Halloween! Tonight we ventured to Juhu Beach, on the Arabian Sea (and many Bollywood stars live over here). 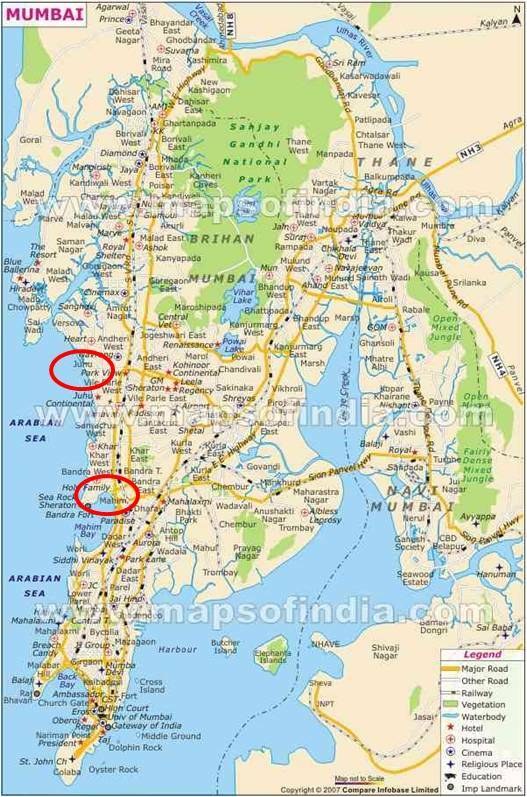 On the map below, the lower red circle is where the office is and Juhu Beach is the upper circle. We ate at a great restaurant overlooking the beach. It was like an oasis of calm coming off of the busy noisy street. Riding in a rickshaw is just like I imagined, even more fascinating. I feel like I’m on the Amazing Race when I’m in one. You can go about 1/2 hour for $2. It’s a bit scary, I was afraid we’d take out a few pedestrians or hit a few other cars, but it seems to work here. You get a great view of the street. The streets are crazy – there are people selling things all day, everywhere. Going to venture out to the shopping areas tomorrow after work. More reports to come, I’m here for over another week. And pictures when I’m back stateside! < Previous Someone’s Getting Married! Next > Back from Mumbai!